“Edge” can be defined as the very direct and biting remarks that would throw almost anyone back on their heels or start a vicious fight. But no matter how rude she gets, he still keeps coming back for more just like a punching bag. She wants to be heard without yelling and she wants to honor her needs, without the edge. She wants the freedom of being able to walk away, without having the need to push people away. There are a few people in each of our lives whom we really genuinely care what they think about us (this should be a short list). We want to make the people we love the most proud of who we are. But mostly, we just want to be look in the mirror and like the person that stares back at us. We want to know our inherent worthiness and feel our light from within shining brightly and boldly. First, Brooke needed to get really clear about what was important to her and what would make her feel good about how she handled this once it’s all said and done. Next, she had to do some deep forgiveness work. Forgiving and releasing him for the hurt he caused and never fully owned. Forgiving herself for not trusting her own intuition and allowing and accommodating much more than she should have for the possibility of love. Once she was able to see that they both were just doing the best they could with what they knew at the time, there was no longer a need for edge or disrespect or trying to cause additional hurt. “No” can be a complete sentence. You don’t have to justify your “no.” You don’t have to make-up an excuse or tell people all the reasons why you don’t want to do something. You can just simply say, “no” (or “No, thank you”) to everything that doesn’t feel like love and everyone that doesn’t bring you joy. No edge. No attitude. No indignation. No apologies. No need anymore. 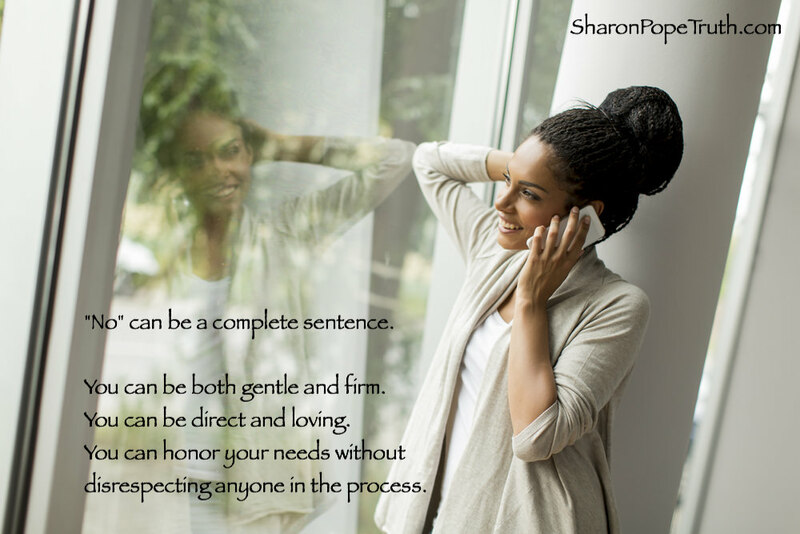 You can be both gentle and firm. You can be direct and loving. You can honor your needs without disrespecting anyone else’s in the process.